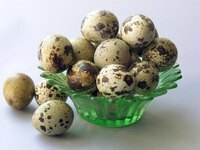 Quail eggs often are used in Asian cuisine, particularly Japanese, but they can be adapted to many recipes. Once they are hard-boiled, they taste the same as boiled chicken eggs but are much smaller. The speckled shells are attractive but thin enough to easily remove from the cooked egg. Since they are much smaller than chicken eggs, it takes less time to boil quail eggs. Store the eggs for a week before boiling because week-old eggs are easier to peel than fresh-laid ones. Fill a pot with cool tap water and 1/8 tsp. of salt. Set the quail eggs in the pot in a single layer, arranging them so they aren't touching one another. Heat the water over medium-high heat until it begins to boil. Boil the eggs for five minutes, stirring the eggs gently with a wooden spoon. Stirring prevents the yolks from hardening on one side of the egg. Remove the pot from the heat once the cooking time completes. Gently pour the eggs into a colander, and run cold tap water over them until the eggs are cool enough to handle. Roll the egg on the counter top, breaking the shell on all sides. Peel under running water soon after cooking because waiting can make them more difficult to peel. You can dissolve the egg shells instead of peeling them. Soak the boiled quail eggs in vinegar for 12 hours or until the shell dissolves completely. Use boiled quail eggs as you would hard-boiled chicken eggs, or serve them as a snack on their own.